Omaha, Neb. - On August 17, 1975, racing lost one of its down-home heroes when Tiny Lund was killed as a result of an accident at the Talladega Super Speedway. The gentle giant from Harlan, Iowa was a crowd favorite. He became a legend in 1963 pulling Marvin Panch from a burning sports car at Daytona, then taking Panch’s place driving the Woods Brothers #21 and winning the Daytona 500. In 1975, four days before his fatal accident at Talladega, Lund won a race at the Summerville Speedway in South Carolina called the Patriot 200. 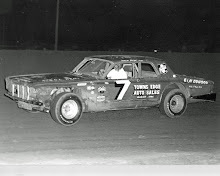 To honor Lund’s memory the race became known as the “Tiny Lund Memorial.” In 1976, Ray Allison won the race renamed the “Tiny Lund Memorial.” Dirt Late Model legend Buck Simmons won in 1977, Al Bailey in 1978 and another Dirt Late Model legend Freddy Smith in 1979. 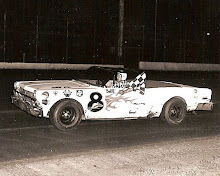 The Fifth Annual Tiny Lund Memorial saw the first repeat winner as Baldwin, Georgia’s Buck Simmons got by Larry Moore with just eleven laps remaining and drove to a three second victory in the 100-lap affair. Moore finished second with Rodney Combs, Jack Pennington and Sammy Sommers rounding out the top five. Moore, who started on the pole was the dominate car in the event, leading the most laps before brake problems in the final stages of the races allowed Simmons to make his move. Another strong challenger was Freddy Smith who was battling the leaders when he was pinched high by Mike Head and was eliminated from competition. Qualifying race winners were; Sommers, Billy Manor, Leon Archer and Haskell Willingham. 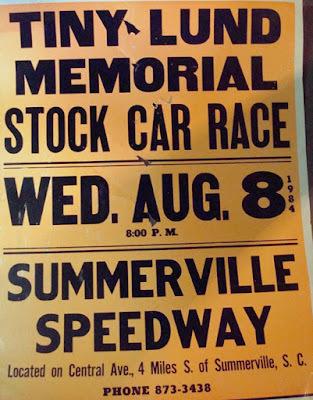 The 1981 Tiny Lund Memorial could be called “turnaround is fair play” as Larry Moore returned to the Summerville Speedway and this time would not be denied. Moore put his Tri-City Camaro out front at the start and stayed there the whole 100 laps in picking up a nine second win over his teammate and ironically the driver who defeated him the previous year, Buck Simmons. Moore pocketed $3,300 for the victory. Tire wear played a major part in the outcome of the race as several drivers’ tires went away in the late stages. In the early stages of the race Moore managed to stay just ahead of a tight scramble behind him which included Leon Archer, Jack Pennington, Buck Simmons, Mike Duvall and Charley Powell III. As the race wore on, Moore was able to charge to the finish line and win by a comfortable margin while several earlier challengers faded. Simmons held on for second, Pennington finished third with Leon Archer fourth and Powell III getting around Duvall for fifth on the last lap. Archer and Duvall admitted after the race that they had their tires mixed up and had the wrong compound on. One driver who was unable to make a run at a repeat win was Kings Mountain, North Carolina’s Freddie Smith. 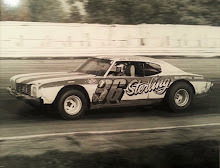 The 1979 race winner destroyed his B & D Boilers Camaro in practice, the result of a stuck throttle which sent him slamming into the third turn retaining wall. Smith’s car was a total loss. It seems that to win the Tiny Lund Memorial you first must have bad luck the year before. Larry Moore proved that concept in 1981 and Freddy Smith proved it in 1982. Smith started things off by out qualifying the field as he posted a lap of 17.217 seconds around the 4/10ths mile oval. Starting on the pole, the driver who became known as “The Southern Gentleman” then led the 100-lap main event from start to finish. Smith’s win was not a cakewalk however, as he was constantly pressured by Larry Moore and Jack Pennington as the trio weaved through slower traffic. At the end Smith’s margin of victory was just 1.7 second over Moore with Jack Pennington finishing third and Fulmer Lance fourth. 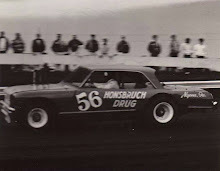 The race turned out to be one of little attrition as 19 of the 26 starters were running at the finish, the most of any of the seven Tiny Lund’s held up to that time. 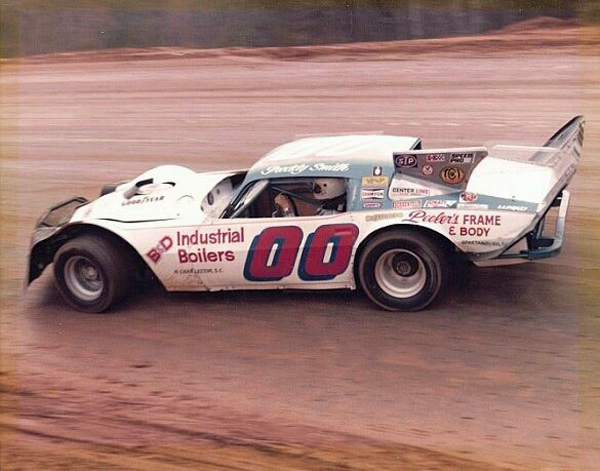 One contender you did not last long was two-time race winner Buck Simmons. The 1977 & 1980 race winner lasted just 19 laps before the engine in his Firebird expired. Misfortune would once again decide the outcome of the Tiny Lund Memorial in 1983. 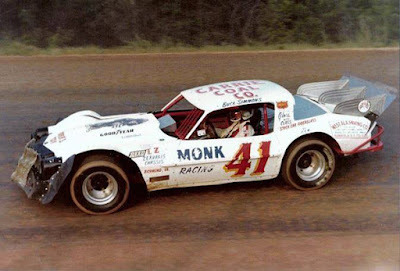 Buck Simmons looked like the races’ first three-time winner, as after out qualifying the field with a lap of 17.491 seconds Simmons was leading the race on lap 71 when his Barry Wright #41 misfired going down the backstretch and coasted to a stop in turn three. The magneto in Simmons’ engine had broken leaving him without power. Second running Jack Pennington of North Charleston, South Carolina, always in the mix for a win at the Tiny Lund assumed the lead and drove his B & D Boilers Firebird to the win and a check for $5,000. 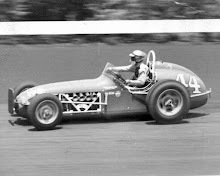 Finishing right on Pennington’s bumper was another car sponsored by Beadie Lynch’s B & D Boilers in the person of two-time race winner Freddy Smith. Larry Moore finished third, Leon Sells fourth and Mike Head fifth. Head had earlier won the consolation race which earned him a starting spot near the end of the 23-car starting field. While Simmons had dominated the race, at the start outside pole sitter Fulmer Lance had gotten the jump on him only to surrender the lead to Simmons in turn four. Lance then started to fade as Pennington passed him two laps later. Lance had tire issues throughout the race and finished ninth. At the halfway mark it was Simmons, Pennington, Moore and Smith. After Simmons left the race, Smith got by Moore on lap 83, taking second with Sells getting by Head in lapped traffic late in the race for fourth. Fate or luck one again played a part in the outcome of the 1984 edition of the Tiny Lund. 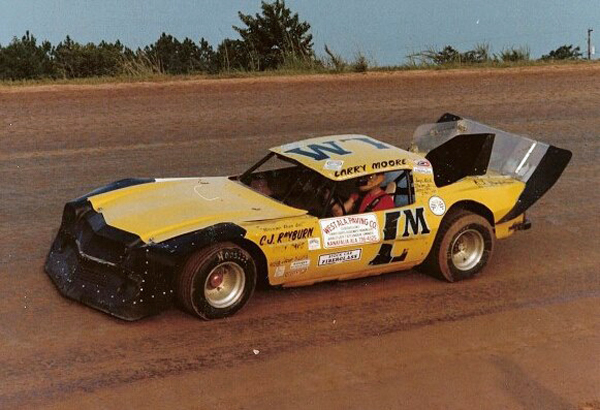 Larry Moore, then racing out of Seneca, South Carolina avoided a major accident on lap 30 and then held off the late race charge of Rome, Georgia’s Buddy Morris to become the races third two-time winner. Jack Pennington was leading the race on lap 30 and working his way through lapped traffic when a multi-car accident was triggered that eliminated race leader Pennington with major front-end damage. The accident also took out second running Lee McCallister and damaged the car of fourth running Freddy Smith. Moore, running third at the time just barely slipped through the mud on the low side and assumed the lead. When the race resumed, Moore was able to open a good-sized lead over second place Ricky Brant. Meanwhile, Smith had returned to the race after making repairs, but was caught up in a battle with Hal McGraw. On lap 74, Morris moved around Brant for second and started to chase down Moore. A lap 84 caution tightened the field up and although Morris was all over Moore he could not get around as Moore picked up his second Tiny Lund Memorial. Morris was second, Brant third, Al Bailey fourth and Charley Powell III fifth. The 1985 version of the race was sanctioned by the NASCAR Busch All Star Tour Super Series and Chattanooga, Tennessee’s Ronnie Johnson making his first visit to Summerville out charged pole sitter Gene Chupp into the lead at the drop of the green and lead the entire 100 laps to pick up the win. “I’ve always wanted to come to this race, now I wish I had been coming before, exclaimed Johnson after the race. 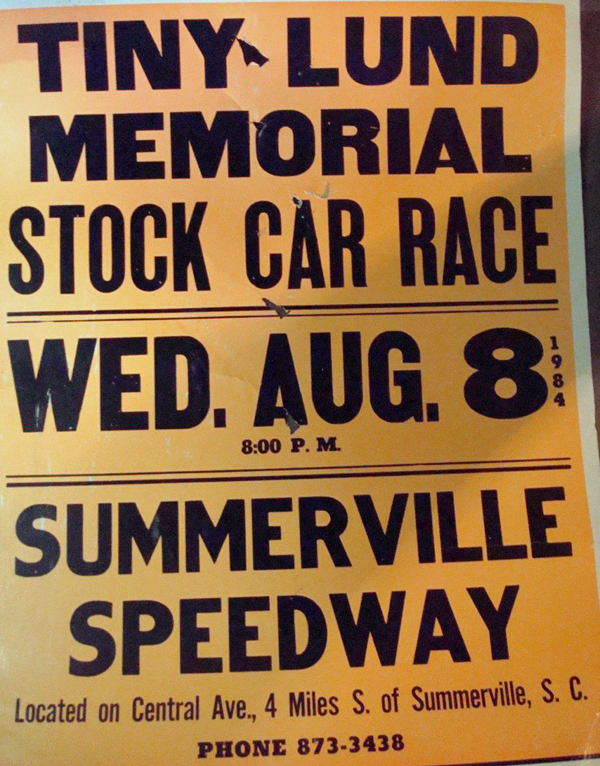 Following the 1986 racing season, the Summerville Speedway was paved and remained a NASCAR weekly racing series track for years to come. But by 2004 it was struggling to draw fans and the track was closed and sold to the Landcraft Development Company ending a four-decade run as the place to be on Saturday nights.